James Hogg, tacksman of Borlun in the parish of Reay had settled in Caithness from East Lothian in 1765. He did not endear himself to many local inhabitants to the extent that his house was burned down and eventually he emigrated to North Carolina from Greenock on the Penelope on 11 July 1775. Previously he had charted the Batchelor of Leith to transport himself, family of three and six servants with 204 emigrants to Wilmington, North Carolina. Departing from Thurso in September 1773 storm damage aborted the voyage forcing the ship into Stromness in the Orkney Islands. A second attempt was made in October 1773, but again storm damage forced the ship to seek safety this time in Vaila Sound in the Shetlands where she over-wintered returning to her home port of Leith on 29 April 1774. Many of the original emigrants on board came from Caithness and Sutherland. 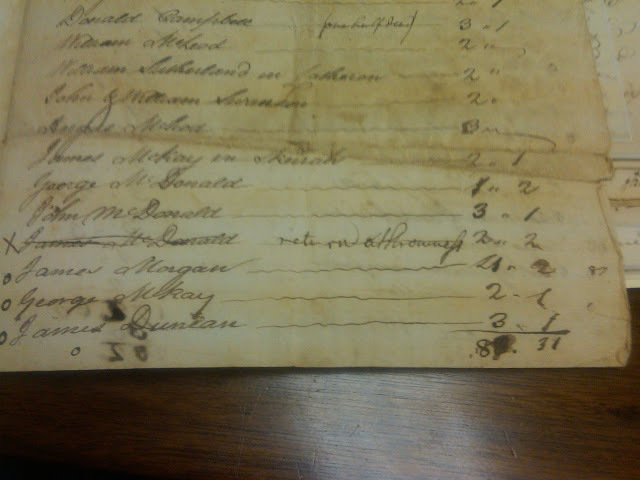 Hector Mcdonald, Aged 75, Married, a Farmer, hath three sons who emigrate with him, John, Alexander & George from 27 to 22 years old, also two Grand Children Hector Campbell aged 16, and Alexr Campbell aged 12, who go to their Mother already in Carolina. Resided last at Langwall in the Parish of Rogart in the County of Sutherland, upon the Estate of Sutherland. Intends to go to North Carolina, Left his own Country because the Rents of his possession had been raised from One pound seven shillings to Four pounds, while the price of the Cattle raised upon it fell more than One half, and not being in a Corn Country the price of Bread was so far advanced, that a Cow formerly worth from 50sh. to ? 3 - could only purchase a Boll of Meal. He suffered much by the death of Cattle, and still more by oppressive Services extacted by the factor, being obliged to work with his People & Cattle for 40 days and more Each year, without a bit of Bread. That falling into reduced Circumstances he was assured by some of his children already in America that his Family might subsist more comfortably there, and in all events they can scarce be worse. Ascribes the excessive price of corn to the consumption of it in distilling. James Hogg’s personal papers are held at the Southern Historical Collection at the Louis Round Wilson Special Collections Library which is part of the University of North Carolina. the Shetland Islands, the emigrants' controversy with Hogg, and his controversy in Scottish courts with the ship owners; and scattered papers, 1778-1824, of Hogg and his family after they settled in Orange County, N.C., where Hogg became a prominent resident of Hillsborough, N.C. Undated papers include genealogical material. 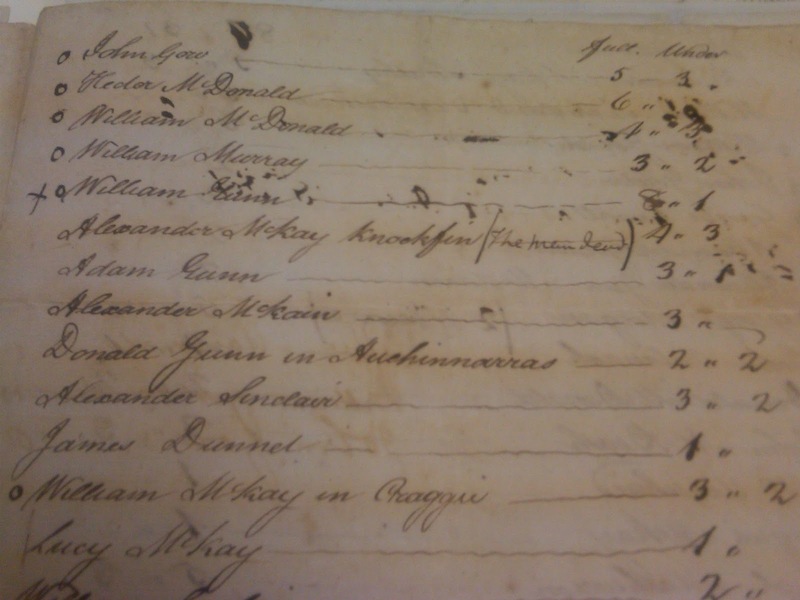 A friend Keith Macdonald accessed the collection and below are several pages of the manifest for the Batchelor of Leith, including Hector McDonald.